The sanderling sandpiper is busy scurrying along the ocean beach "chasing the waves" and looking for coquina shells from the sea; the sandpipers favorite food. 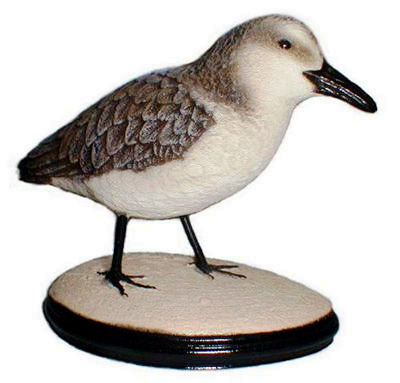 This lifesize sandpiper sculpture is the beachcombers favorite little waterbird companion. Dressed in winter plumage, this little bird is surely a shorebird for you! Sanderlings are a most widely recognized and distributed shorebird. This sandpiper is 6.5 inches in length and nests in late May through late June with a clutch of 4 eggs. After an incubation of 24-31 days, they hatch and fledge in 17 more days. Sanderling diet consists primarily of aquatic invertebrates (sand fleas, coquinas ..). Plumage feathers vary (Fall:light and gray; Spring:chestnut breast) the beak and feet are always black. Juvenile birds have checkered upper parts.